Calling all Buckeyes fans around the world! 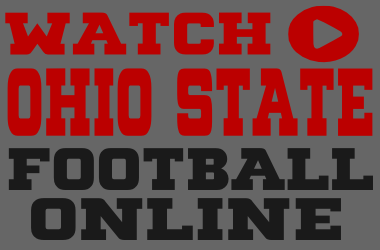 We search the web for the best place to watch Ohio State football online. Never again will you freak out minutes before kickoff because you can’t find the Buckeyes game. We show you where to find the official Ohio State football live stream online. We live in the best of times, you can get Ohio State football live streaming on any type of device anywhere in the world. Our collection below features the very best, official and legal sites to help you find Ohio State Buckeyes football on the Internet. Don’t come here looking for illegal Ohio State football live streams or any type of links to games other than the official digital media partners of the Ohio State University. Bookmark Big Ten Football Online for all the legal and official live streaming football game links for each Big Ten Conference school in one place. You will only get the official Ohio State football live streams here. Big Ten Football Online is a fan site that shows you where to watch Ohio State football online legally. Don’t visit Ohio State football live streaming links you don’t trust – it’s most likely malware! Watch Ohio State Buckeyes football games on ESPN, ABC and the Big Ten Network this fall. The Big Ten Network owns the rights to televise the majority of Big Ten football games. Fans can also watch Ohio State football streaming online with coverage on iPhone, iPad or smart phones with BTN2Go. Also, if you live outside the United States, don’t worry Buckeyes fans! You can watch Ohio State football games online anywhere in the world with BTN2Go International. Watch the Ohio State Buckeyes football game online – Find out where you can watch Buckeyes football on your PC, iPhone or tablet. The Ohio State Buckeyes are always in the running for the Big Ten Title and National Championships in football and basketball. Don’t miss any chance to watch the Buckeyes online this year. Get 24/7 coverage, classic games and in-depth features of all the OSU Buckeyes varsity teams in high definition digital video. If you want to watch Ohio State football online then you’ve got to check out Buckeye Vision. Get exclusive digital coverage of every Buckeye sporting event streamed to any device from the official live streaming media partner of the Ohio State University. You’ll understand why everyone says it’s the best way to watch the Ohio State football game online! The Ohio State University was founded in 1870 in Columbus, Ohio. There are currently 57,000 students enrolled at the Ohio State University, one of the largest universities in the US. The Ohio State Buckeyes is the nickname of the Ohio State University athletic teams. The Ohio State Buckeyes began playing varsity football in 1890 and joined the Big Ten Conference in 1912. Ohio State plays its home football games in 102,329 seat Ohio Stadium. The tradition rich Buckeyes football program has won seven national championships as well as 36 Big Ten Conference titles. And, in the final game of the football season, the meeting between Ohio State and Michigan is one of the most intense and passionate rivalries in all of college football. Visit Big Ten Football Online to find out where to watch Ohio State football games online this season. Get the schedule, date, time and channel for every one of the Buckeyes football and basketball games.